Climb up 10,000 feet to what feels like the top of the world on the San Juan Skyway. Explore the dry deserts of the southwest to the lofty heights of the San Juan Mountains home to 1,000 peaks above 10,000 feet and 14 of Colorado’s fifty-four 14,000-foot peaks. At 14,158-feet, Mount Sneffels is the highest peak of the Sneffels Range, part of the San Juan Mountains which were formed by lava and ash and gracefully carved by glaciers. The resultant mountains are highly mineralized and fueled the rich mining industry of the past (and present) still visible along the scenic route. While many billions of dollars have already been extracted, it is believed to be only a small portion of what lies in the hills. The scenic drive begins in Ridgway and does a clock-wise loop. From Ridgway, head north on US-550 and stop at Ridgway State Park (H1). Nestled in the “Switzerland of America,” the Ridgway Reservoir is surrounded by stunning views of the snow-capped San Juan Mountains. The park has an unlimited array of activities, including swimming, boating, camping, fishing, hiking and gold panning! Heading south on US-550, the road travels along the Uncompahgre River, skirting between mountains and hills as you enter the Uncompahgre National Forest. Ten miles from Ridgway, you arrive in the town of Ouray, named after the Ute chief who inhabited this region until prospectors found riches in the mountains and drove them out with the Brunot Treaty of 1873. The region is well-known for its hot springs, Relax in the therapeutic Ouray Hot Springs Pool (W1) before exploring the turn-of-the-century, historic downtown with its quaint galleries, shops and restaurants. Continue on the dirt Box Canyon Road to Box Canyon Falls Park (H2), where Clear Creek cascades 285-feet down through a narrow, limestone gorge. For the best view of the roaring waterfall, follow the short walkway to suspension bridge. The park itself features a Visitor Center with interpretive exhibits on the geology, wildlife, rare plant life and history of the area. Many gazebos, open meadow and forest make for great picnicking and the park has been designated an important bird watching area by the National Audubon Society. Continuing south on US-550, the road begins to climb into the mountains through a series of switchbacks. This section of road is known as the Million Dollar Highway. Locals disagree as to whether it is named for the millions of dollars of gold, silver and other minerals extracted from these mountains, the cost of building the road, or for the spectacular views. Along the way, you will pass abandoned mines, travel through mountain tunnels, waterfalls, gorges and jaw-dropping mountain views along this cliff-hanging road that continues to rise. 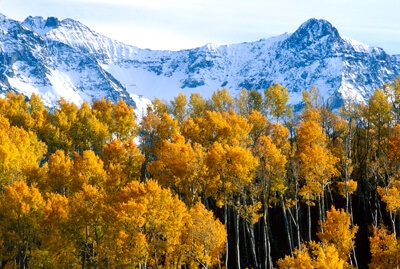 After a few roller-coaster hairpin turns, iron-rich red-orange mountain peaks and hillsides come into view, some so colorful they appear to have been painted, particularly in the fall when the aspen’s golden leaves glow. In a few miles, you head over the Red Mountain Pass at 11,018 feet of elevation, which separates the Uncompahgre National Forest and the San Juan National Forest. The road from here descends 1,700 feet through valleys and dramatic views until arriving in Silverton in 10-miles. The mining town of Silverton has many Victorian buildings registered as National Historical Sites, most older than in other towns along this route simply because it has not suffered the misfortune of fire, possibly because of its annual 300-inches of snow. Experience the Old west with a train ride on the Durango-Silverton Narrow Gauge Railroad (M2), a historic coal-fired, steam railroad that has run between Durango and Silverton since 1881. You can either enjoy a day-long train ride or visit the railroad museum. Learn about the history of the region in the San Juan County Historical Museum (M1), housed in the old San Juan County Jail built in 1902, or consider a side trip on the Alpine Loop which follows the Animas River to the Animas Forks ghost town. Heading south on US-550, the road again climbs as you arrive at Molas Pass which affords a spectacular view of the mountain peaks surrounding the picturesque Molas Lake, including the West Needle Mountains and the Granadier Range. Stop at the lake for fishing, hiking, and camping opportunities. Continuing through hilly valleys surrounded by mountain peaks, the trees along the road change from aspens, spruce and fir to ponderosa pine. On the way, stop at the various lakes, including Andrews Lake which is a short hike from the East Lime Creek Rest Area (H5) and Haviland Lake (W3) which offers a beautiful view of the Hermosa Cliffs. As you arrive in Durango, you enter the high desert with occasional cacti. The downtown has beautiful Victorian architecture, an inspiring art scene and is fast becoming an agritourism destination featuring on-farm and ranch tours offering fruits, vegetables, grass-fed and organic beef, pork, lamb, free-range chicken, eggs and artisan cheeses. The town is also the start of the 469-mile Colorado Trail that runs all the way to Denver. It is divided into 28 segments, making it easily accessible for day-hikers. After Durango, head west on US-160 through rolling hills, beautiful mesas and mountain peaks peering out above the horizon. In 34 miles, Mesa Verde National Park (H7) will be on your left and is home to hundreds of cliff dwellings built by the Anasazi People between A.D. 450-1300. Mesa Verde is a World Cultural Heritage Park designated by UNESCO and you can spend days here, exploring over 4,500 archaeological sites and extraordinary setting. Stop at Chapin Mesa Archaeological Museum where dioramas illustrate Puebloan life, and their incredible skills used to weave and create pottery and masonry, as well as prehistoric artifacts. In addition to the historical significance of the park, the 23-mile scenic drive to the end of the park affords spectacular views of canyons and mesas. Leaving Mesa Verde National Park, consider a trip on Trail of the Ancients which heads towards Utah’s Monument Valley or the Four Corners Monument (V3). This scenic drive continues along the same path for a portion of the drive. Continue west on US-160 until Cortez, where you should then take CO-145 to Delores. The Anasazi Heritage Center (M3) honors the history of the Anasazi People and other Native cultures in the Four Corners region with exhibits on archaeology, local history, and lifestyle, including how they weaved and prepared corn. A short trail will bring you to two pueblos. The Anasazi Heritage Center is also the visitor center for Canyons of the Ancients National Monument, which protects more than 6,000 ancient ruins. Our drive will be heading there shortly, so pick up any required information before leaving. Continuing north on CO-145, you follow the Dolores River and start climbing back into the San Juan Mountains. Notice the layers of magma that formed the mountains. Moments after Rico, the awkward 13,113-foot Lizard Head peak comes into sight on the left. A few miles later is the Lizard Head Peak Vista (V2), where you can admire this free-standing volcanic neck, crumbling from erosion. Descending from the pass, Trout Lake (W5) is on your left. The idyllic setting of pristine lake surrounded by mountains creates a haven for swimming, fishing, boating, and hiking. After the lake, the road quickly descends into U-shaped glacier-created valleys with the San Juan Mountains soaring 13,000 feet above. In 10 miles from Trout Lake, you arrive at an intersection. Take a short side-trip to Telluride. In winter, the town is a popular ski resort but reigns as a year-round recreation destination with golfing, fly fishing, glider rides, off-roading and more. Among the downtown’s Victorian buildings is the first bank Butch Cassidy robbed in 1889. Explore the many galleries, museums and heritage with a stroll or hike to Bridal Veil Falls (H4) which drops 425-feet off of a cliff, making it Colorado’s longest free-falling waterfall. The falls can be viewed from a number of vantage points and the adventurous will want to climb the 4-mile one way trail to the top. Retracing back to the intersection, consider a hike along the Keystone Gorge Trail (H8). The drive continues west along the San Miguel River, heading through more rolling hills and spectacular views of red cliffs and mountains. Near Sawpit, the San Miguel River parts from the road. Consider a side-trip on the dirt Last Dollar Road (T1) which connects Sawpit and Noel following a former railroad to Leopard Canyon along the San Miguel River to the mountain pass, Dallas Divide. As you approach Placerville, you enter the San Miguel River Canyon and the CO-145 joins CO-62, which this drive continues east on. Heading west would bring you to the Unaweep-Tabeguache Scenic Byway. The road continues with more breathtaking views of the tall peaks of the San Juan Mountains and red sandstone cliffs. The drive climbs up and over the 8,970-foot Dallas Divide Mountain which provides wonderful panoramas of the area. The road then descends to Ridgway where the scenic drive comes to an end.